St Helen is one of the best-loved Saints of the Christian community, both in East and West. Over many centuries in England her name has been much used for our daughters, in various forms - Ellen and Eleanor being favourite variants. No doubt this has been partly due to much-loved Queens of England, but certainly the Saint herself has been greatly venerated, and as many as 135 ancient English churches are said to be dedicated in her honour. Eastern Christians love her too, and this has meant she can draw together modern western converts to Orthodoxy and the cradle-Orthodox who have moved to Britain from the East. Many widely venerated eastern Saints have been unknown in the West, and only gradually will British converts to Orthodoxy be able to absorb them deep into their consciousness. In the same way, many Saints from Britain's Orthodox past - i.e. before the Great Schism commonly dated to 1054, and the Norman Conquest of Saxon England in 1066 - are unknown to easterners. These western but entirely Orthodox Saints will take some time to become really loved by Orthodox Faithful who have come here from the East. Yet we can all, from East and West, without difficulty love and admire St Helen. St Constantine her son is a rather different case. Always much honoured in the East, in the West he has seldom been venerated as a Saint at all, and in recent years has been neglected, sometimes actually sneered at and despised. Converts to Holy Orthodoxy need therefore to rediscover him, and find out why that common western attitude is totally unjust to his memory. We must discover why the Orthodox Faith venerates him deeply, along with his mother St Helen, as "Equal to the Apostles". We need to rethink our inherited attitude to him, as we enter more deeply into Orthodoxy. The fact is that his reign transformed both the Roman Empire and the Christian religion. His actions have had an enormous and lasting influence. Amazingly, seventeen hundred years after his time, his influence is clearly perceptible still. We must perhaps admit that, in some respects, the effect of some of of his actions has been regrettable. For example, in places there has resulted too close a link between Church and State, to the disadvantage of either society at large or of the Church and her interests, and sometimes modern western Christians find it hard to distinguish between Christian and secular ways: they do not perceive that modern western society, though built on a Christian foundation, is largely secular in its way of thinking. Nowadays we may have to distinguish between on the one hand what society around us thinks, and on the other hand what the Church believes and teaches. People may not understand that there is a particular Christian understanding on some moral matter, or that Christians in a particular situation must behave differently from those around them. But, on the whole, Constantine's legacy has been for the good, and the Orthodox Church is right to recognise a sanctity in him. First he made Christianity legal, after centuries of much persecution. Then he made it the Empire's official religion. He perceived that Christianity was the way the Empire could be united. He saw the resulting need to establish the truths of our religion by calling the first Ecumenical Council in 325. He recognised the tiredness of Old Rome on the Tiber, built on its classical, pagan, past. In its place he founded the exuberant New Rome, Byzantium, on the Bosphorus, on the Christian Faith and its principles - even if neither he nor the Empire fully lived out those principles. By moving the capital he ensured the future of Orthodox Christianity. The "down-side" of Constantine's actions in the sphere of ecclesiastical affairs is that the very transfer of power and influence from Old Rome to New Rome also provided the possibility of, and the fertile soil for, the growth of the monarchical Papacy, and of Papal claims. Over the following centuries this produced a serious distorting of the Christian faith in the West, which the Protestant Reformation did little to right. Yet the fact is, if he had not moved the seat of government from Rome to Byzantium, it is conceivable that, under pressure from the barbarians, Christianity may not have survived - not, at least, as we know and believe it. For while the Western Roman Empire came to an end a hundred or so years later and much of Europe entered the "Dark Ages", the Byzantine Empire carried on that renewed, Christian Roman tradition for an incredible thousand years, albeit somewhat limpingly towards the end. This was recognised even in the West, and the Byzantine Roman Empire continued to illuminate the world with the Orthodox Faith even after Constantinople's fall in the fifteenth century. That is part of the reason why everywhere Constantine is Constantine the Great. He was certainly no fool, and essentially he was a good and devout man who desired to honour Christ in both his personal and public life. We can say this in spite of several wicked acts he committed. It is wise in any case to remember that numbers of canonised Saints have committed unworthy deeds at various times in their lives, and not only before a conversion. Indeed, he deliberately delayed his Baptism until the end of his life - to cover any misdoings, as it were. Apparently this was the unhappy fashion of his day. But at least, it displays a certain humility before God; an acknowledgement of the awe and reverence with which we should approach the Holy Mysteries. Orthodox Christians have very good reason to thank God for Saint Constantine, and to ask his prayers. And indeed so have all Christians. None more so than the people of Colchester - "Britain's Oldest Recorded Town", say the sign boards proudly - and particularly members of the Antiochian Orthodox parish. For ancient tradition, widely accepted until comparatively recently, is that St Helen was a British princess, born in Colchester. AD 242 Helen, daughter of Coel [King of the Britons], born in Colchester. And they even dared to identify exactly where she was born - "King Coel's Palace" of course (so the legend would run), which is the old name for our celebrated Castle (which is actually the keep of a Norman castle, built on the foundation of the Roman temple of Claudius). Naturally, then, the town of Colchester boasts St Helen as its Patron. About the year 326, when she was in her seventies, she made a great, in some ways world-transforming, journey to the Holy Land and Jerusalem. There, her story tells us, she discovered the Cross of Christ, and the Nails that fixed him to it. Colchester's coat of arms is therefore the Life-giving Holy Cross (green and budding, on a Blood-red field), together with the Three Holy Nails. Also depicted on the shield are the crowns of the Three Holy Kings - for her story tells us that on her pilgrimage she also discovered the remains of the Three Kings, with their crowns. Not only that, but Colchester boasts a small, ancient church dedicated to St Helen. It stands close to the grand Castle. The Oath Book asserts of this chapel, It is said she herself built it. Historically, we must admit the claim is not factual - and perhaps its wording may imply a certain doubt on the matter ("It is said"), even on the part of mediaeval townspeople. But the Chapel was certainly old by the middle of the eleventh century, for it needed restoration just after the Normans came to Colchester. Later it was again restored, with the result that some guidebooks wrongly tell us the building dates only from the thirteenth century. In later mediaeval times it was a chantry, and was last used for liturgical worship at the Reformation. Subsequently it was used as a house, a school, a Quaker meeting-house, a workshop. Then towards the end of the 19th century it was once more restored, by the famous church architect William Butterfield, and became a clergy meeting room. But in recent years it has been used only as a store. Now at the beginning of the third millennium the Orthodox parish, already dedicated to the Saint, has been privileged, by the kindness of Colchester Borough Council and the local Anglican Diocese (in whose ownership it remains), to restore the Chapel to worship. At present we have it for a period of two to four years. 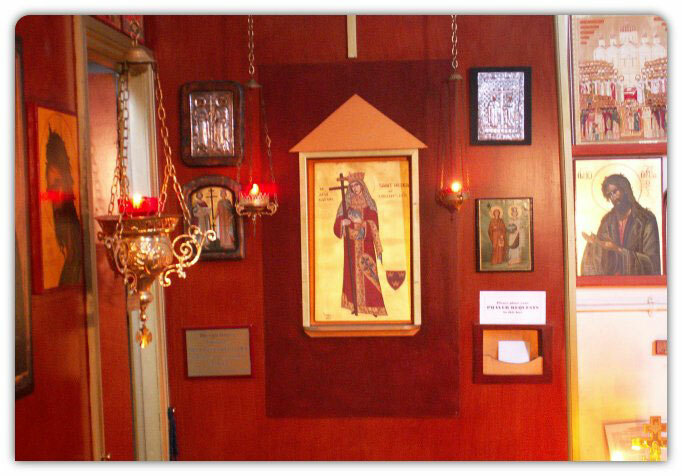 Thus St Helen's Chapel is restored to liturgical worship for the first time for nearly five hundred years, and (since the Great Schism for the first time divided western Christendom from the Orthodox Church) restored for Orthodox worship for the first time for almost one thousand years! We hope to be able to reawaken local people to their proud tradition, and make the Chapel available to tourists also. Especially of course we wish to open up this holy place to pilgrims, to promote it above all as a place of prayer, a real shrine in honour of our beloved Saint. Most "authorities" today state that Helen was born at Drepanum, in Bithynia, an area of Asia Minor near the Bosphorus. But the claim of Drepanum is surely no more proven than that of Britain and of Colchester. It seems to rely merely on evidence that is just as flimsy as ours, i.e. on the fact that Constantine renamed Drepanum "Helenopolis", after his mother. Yet, though he renamed the city of Byzantium "Constantinople" after himself, nobody claims that means that Constantine was born there. Surely he could also call a town across the straits from his new capital after his mother, without any necessary implication that she was born there. He clearly adored his mother, and had already declared her "Empress", though she had not had that title in his father's lifetime. It should be no surprise therefore that he decided he could rename Drepanum in her honour. Nevertheless, the tradition linking her with Drepanum is a worthy one, and we respect it - but say also that the Colchester tradition also is worthy of respect and honour. In any case, there is nothing unusual about different traditions about the same person: go to the Holy Land itself, and find various claims about places associated with Christ himself: these do not compete with each other, so much as complement each other. But local tradition goes further than claiming just St Helen as a native of Colchester. The Oath Book makes the claim that her son, the first and great Christian Emperor, was himself born here. AD 266 Constantine, son of Constantius, born in Colchester of Helen. Constantine the Great, Most Christian Emperor, Flower of Britain, Citizen of Colchester. We must accept that some points in our local tradition are certainly wrong. Helen, for example, was probably not the concubina [sometimes wrongly translated as mistress] of Constantius Chlorus, but his first wife, whom he divorced for reasons of politics, when he became Emperor. Or again, the dates in the Oath Book are wrong - intriguingly, they date events consistently early by some eight or nine years. Yes, we concede that some of the facts themselves may be wrong. But we point out that everywhere a definite connection between Britain and both Constantius Chlorus and Constantine is undisputed: of Constantius that he was Governor of Britain, and died at York; of Constantine that he was first acclaimed Emperor at York, on the death of his father. If tradition counts for anything - as in Orthodoxy it certainly does - will you not allow Colchester, even now, to think of both St Helen and St Constantine as in a special way her "own"? Justified a claim it may or may not be. Perhaps it is merely a claim. But that "claim" springs from the natural and oft-found longing that many individuals and many towns have for a small place in history, the desire to be linked to some individual or event celebrated on the national or world stage. Britain's and Colchester's "claims" in this matter are in fact probably quite as strong as the claims of other places. We may further point out that it is surely the cynical, over-scholarly, cerebral, "de-mythologising" approach that so often actually results in the "de-naturing" of much contemporary Christianity. In Colchester at least we guard this particular tradition, as part of the town's ecclesiastical and civic story, passing it on to future generations of the Faithful. The Orthodox Parish of St Helen of Colchester, by taking over this ancient and beautiful building, has now itself become part of that story, of that history, of that "legend" as some would call it. We are proud of this, and pray that we may be found worthy of our place within that tradition. Saint Helen, pray to God for us. pray for us to Christ our God, that he will save our souls.